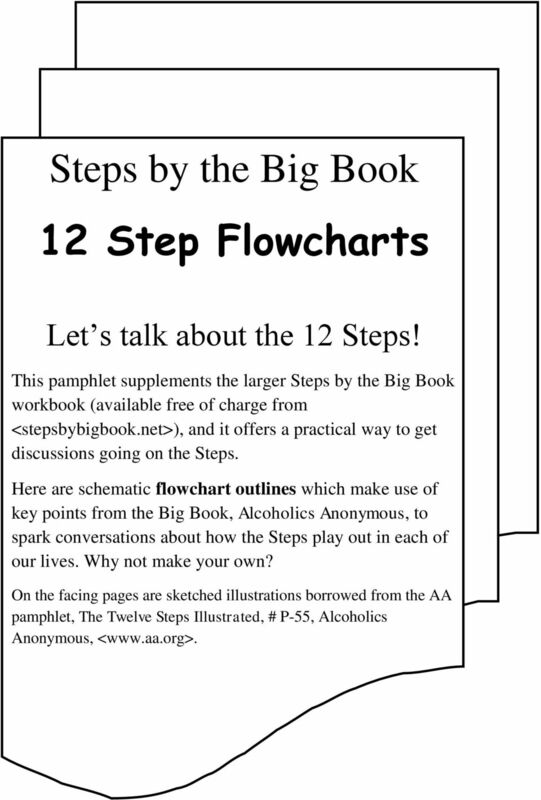 Download "Steps by the Big Book 12 Step Flowcharts"
17 1We admitted we were powerless over alcohol that our lives had become unmanageable. The bottle has me down. My life is a mess. 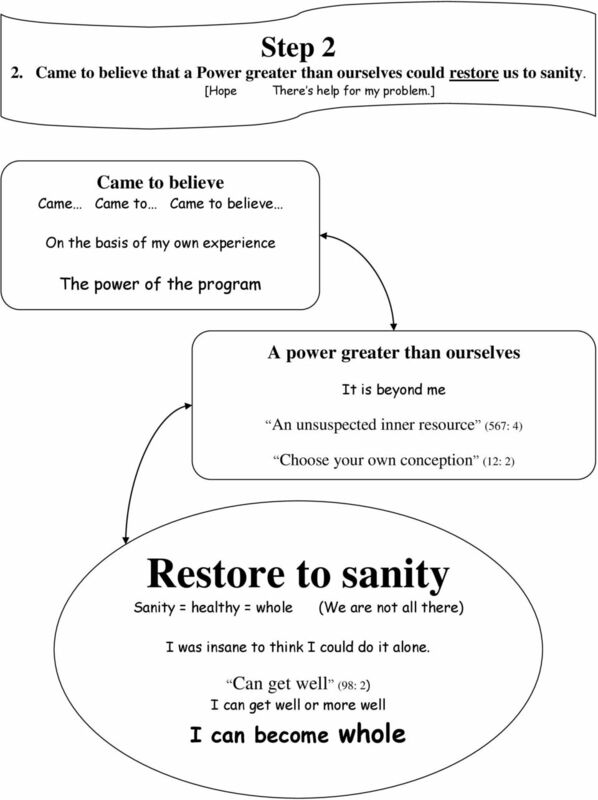 18 2 Came to believe that a Power greater than ourselves could restore us to sanity. There is help. 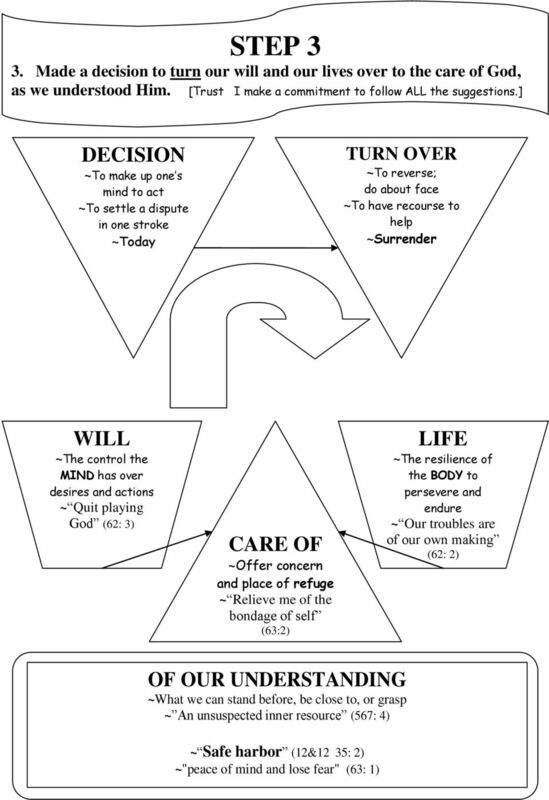 19 3 Made a decision to turn our will and our lives over to the care of God as we understood Him. I let a Higher Power take over. 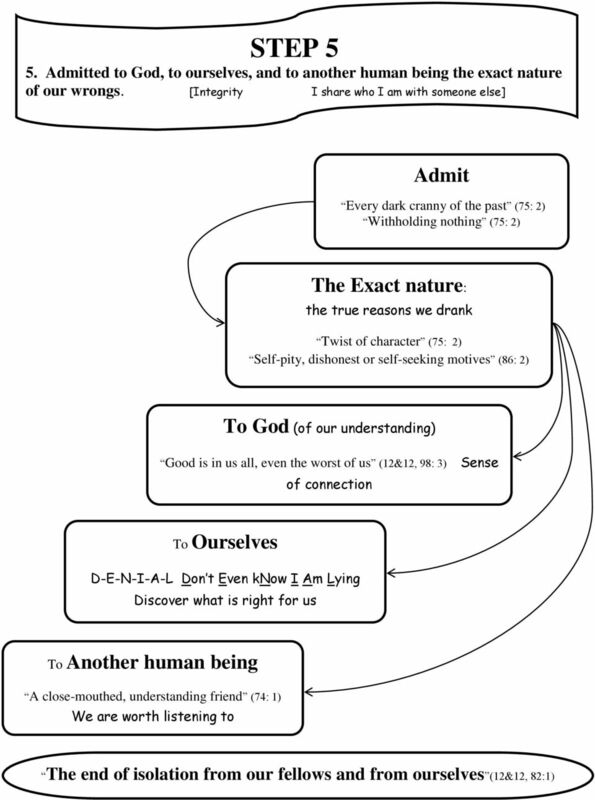 20 4 Made a searching and fearless moral inventory of ourselves. I need to look at my life. 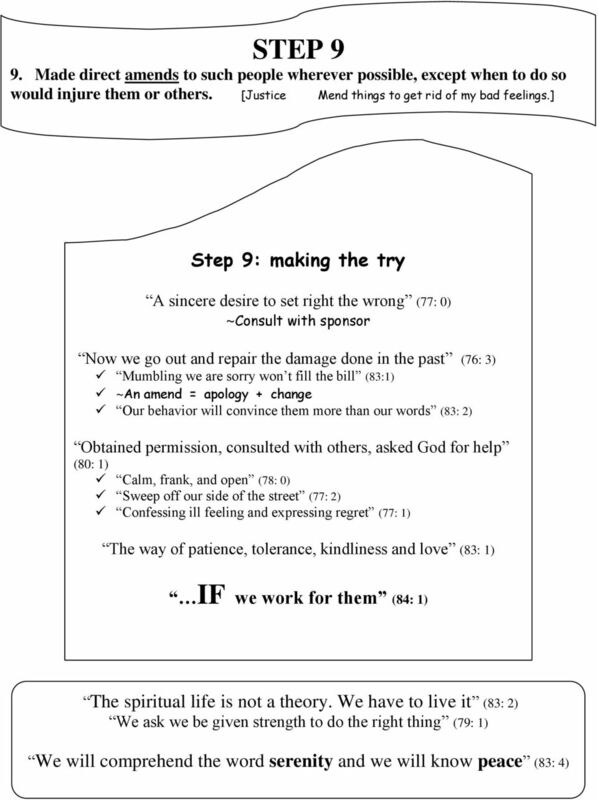 21 5 Admitted to God, to ourselves and to another human being the exact nature of our wrongs. I admit all I did wrong. 22 6 Were entirely ready to have God remove all these defects of character. I want to be free. 23 7 Humbly asked Him to remove our shortcomings. I ask a Higher Power to help me be free. 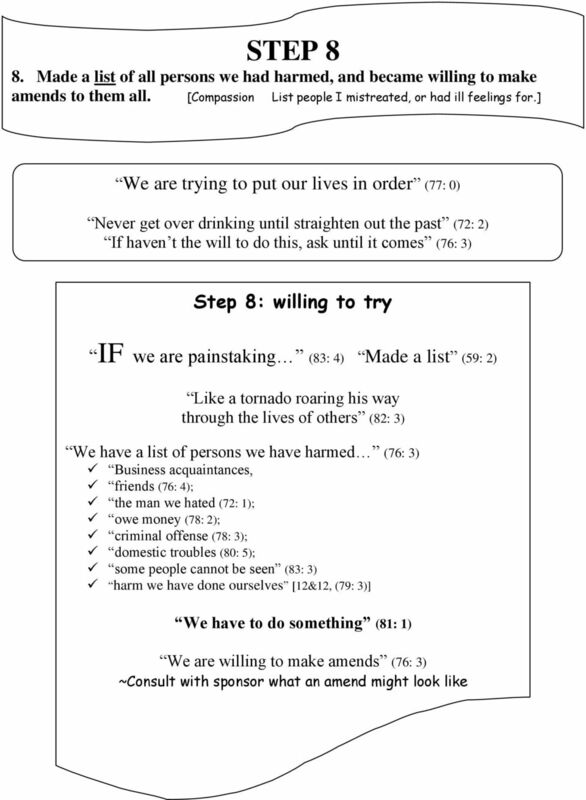 24 8 Made a list of all persons we had harmed, and became willing to make amends to them all. I ask: Who did I hurt? How can I fix it? 25 9 Made direct amends to such people wherever possible, except when to do so would injure them or others. I try to fix things if I can. 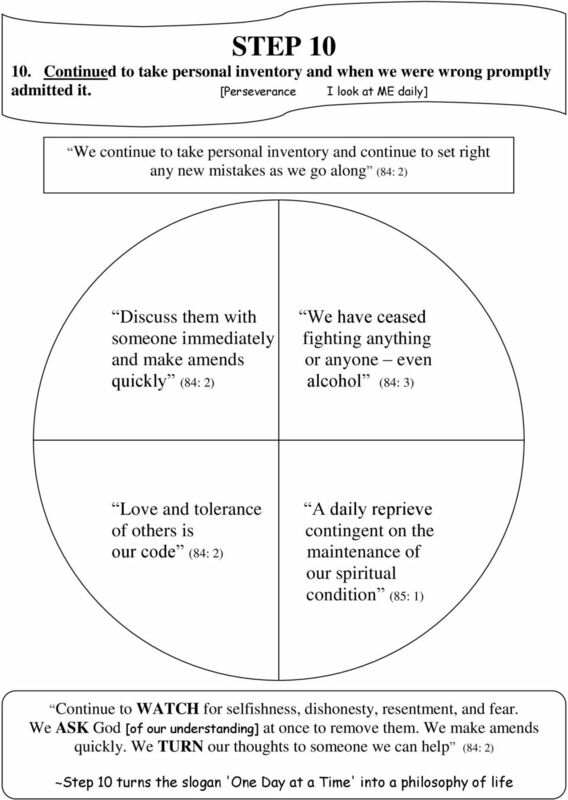 26 10 Continued to take personal inventory and when we were wrong promptly admitted it. I check up on myself. I am honest. 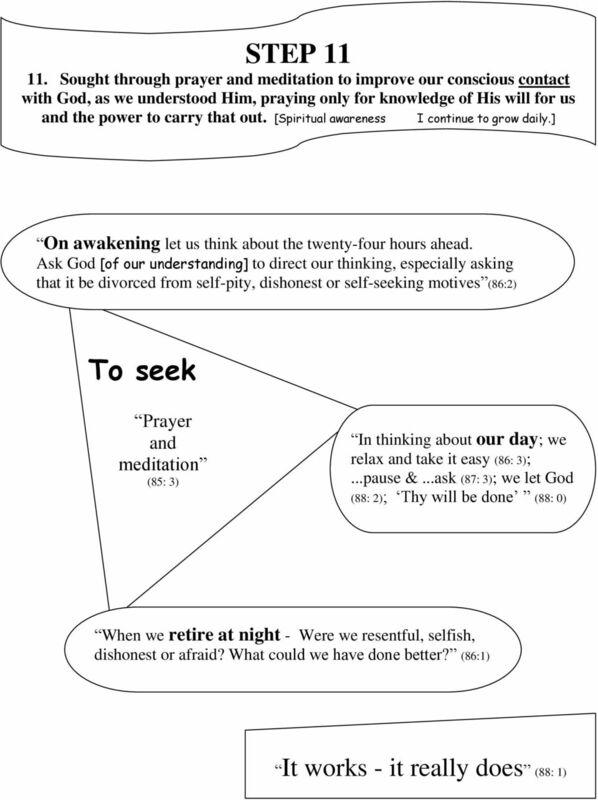 27 11 Sought through prayer and meditation to improve our conscious contact with God, as we understood Him, praying only for knowledge of His will for us and the power to carry that out. I ask a Higher Power for help to live the right way. 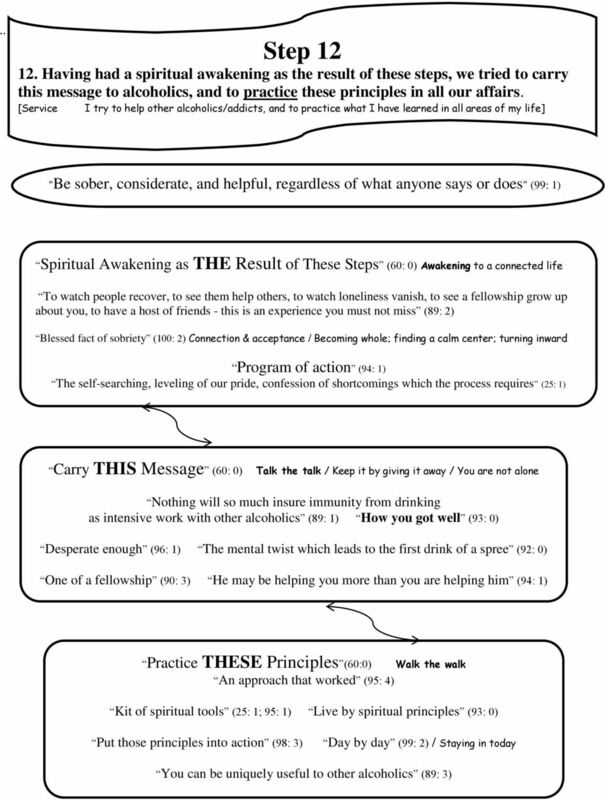 28 12 Having had a spiritual awakening as the result of these steps, we tried to carry this message to alcoholics, and to practice these principles in all our affairs. 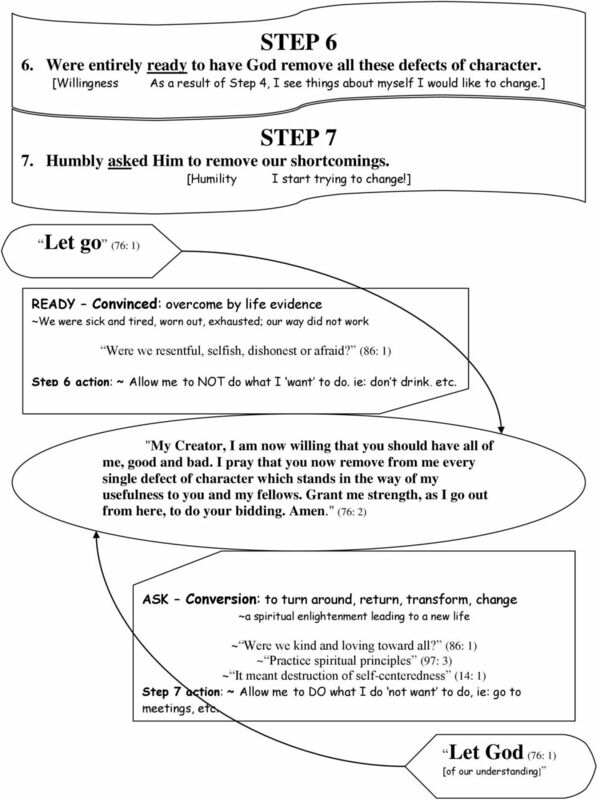 I live by these Steps and get better. I try to help other alcoholics. REVIEW: STEPS. 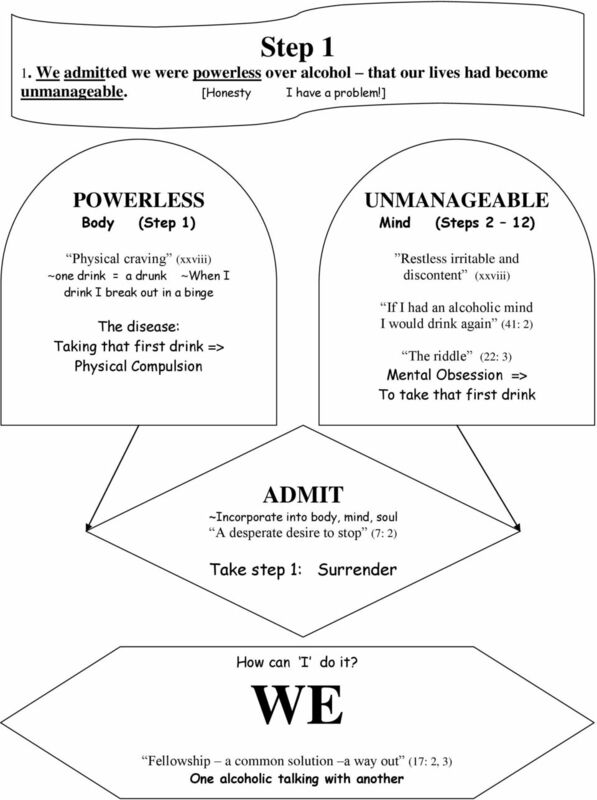 How can we alcoholics/addicts in recovery live happy, joyous, and free? IDDT Training: Group Interventions Self Help Groups. Why is group therapy important for dual diagnosis clients? 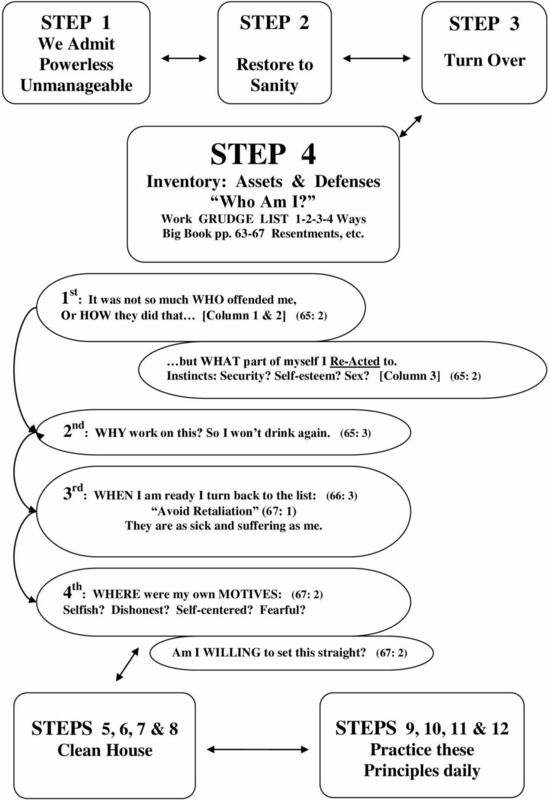 Alcoholism In The Office SCOTT PAIST, III, M. D.
I am Responsible. When Anyone, Anywhere reaches Out For Help, I Want The Hand Of A.A. Always To Be There. And For That, I Am Responsible! Steven Donaldson, M.A., L.P.C. 503.236.7443 www.freefromcompulsion.com Sexual compulsions don't have to rule your life. I can help. Please enjoy this article and then give me a call. You can break free. Step One. 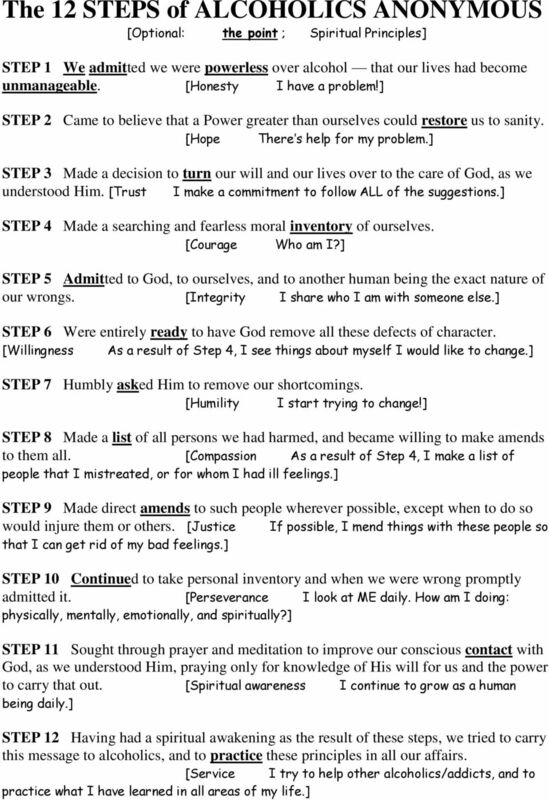 a) Take this step with your sponsor, another member of A.A or an understanding friend. This is A.A. General Service Conference-approved literature I am responsible... When anyone, anywhere, reaches out for help, I want the hand of A.A. always to be there. And for that: I am responsible. Experiential Focusing and Twelve Step Recovery Work by Steve Crawford, MA After being in Sacramento for a year, my life had truly become unmanageable with the unhappy demise of yet another personal relationship. - B Beyond our wildest dreams The OA history, written by our founder, Rozanne S.